I’m proud to say my expert “luggage handling” skills brought me to San Sebastian, Spain this past week. You might expect me to boast about the delicious pintxos or the vino tinto I inhaled in the old town, or about the pit stop at the Guggenheim Bilbao. But I won’t. It’s safe to say I spent much of my time trying to spread the word about a little known town called Borja that is home to an unassuming and fairly nondescript monastery. It is testament to the fact that I live in a self -imposed bubble filled with off-colored trivia that periodically sneaks into the news. Or art news anyway. I’m deep like that. 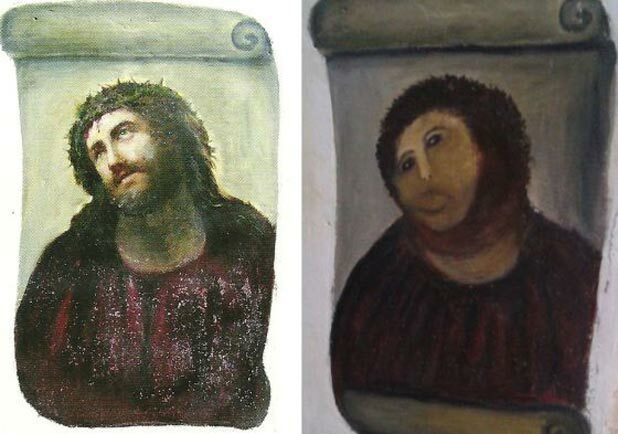 A couple of weeks ago, a report was circulated in the Huffington Post, the New York Times, the LA Times, and known art blogs such as Hyperallergic and ArtInfo, that a 19th century fresco had been saved from deterioration only to be brought back to life by an 80 year old woman, Cecilia Gimenez. My decision to rent a car and drive 120 miles to see her restoration was a no brainer. The outcome is nothing short of shocking. I feel a little guilty trash talking Cecilia’s work, because in her interviews she explained unflinchingly that the Priest had given her permission to restore more completely the Ecce Homo in the Sanctuary of Mercy Church, or Sanctuaria de Misericordia---She’d touched it up here and there in the past. No big deal. 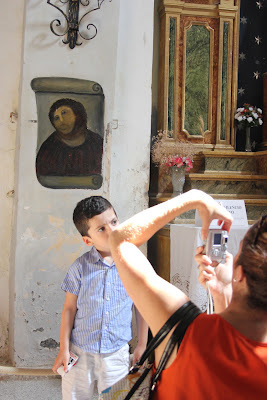 She flung off the false rumors that she had taken it upon herself to repair the fresco. Ecce Homo, or “Behold the Man” is now called Ecce Mono, or Behold the Beast. ‘It’ looks something like a capuchin monkey with weird hair. Or maybe like Jesus got a really bad hair weave and stood too close to some candles. Either way, it’s just not good. Or rather, it scores big points in the “so bad it’s good” department. That I am an atheist is transparently clear to those who know me, so I can’t imagine what a person of Christian faith feels when they see the “Beast Jesus.” I stood in a cue that included cyclists in full gear, grandmothers, parents toting their infants, or with toddler in tow, bikers, girls in cut off denim shorts, and folks like myself who had travelled from a far, all hoping to photograph or be photographed with the now infamous “Ecce Mono”. The spectacle of it is of course a big part of its allure. But is there any superstition attached to it like a statue that sheds real tears? 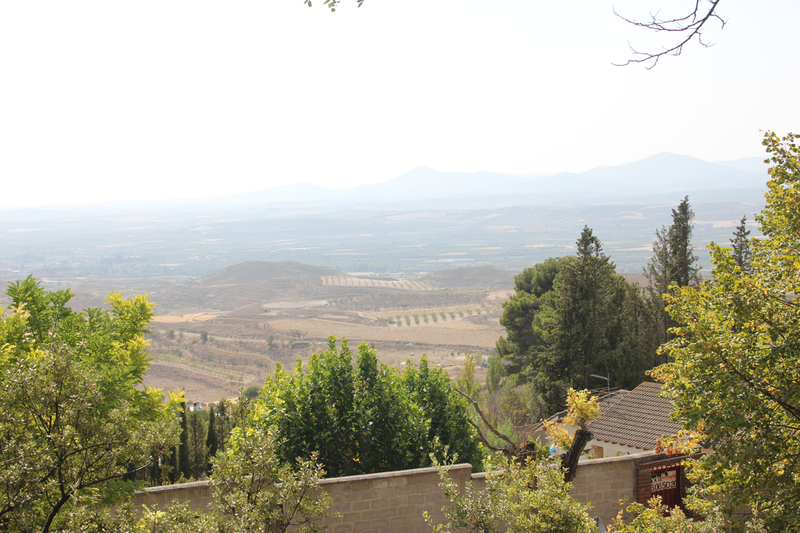 The town of Borja is nestled in Spain’s only desert in a region that is considered to be fairly religious. 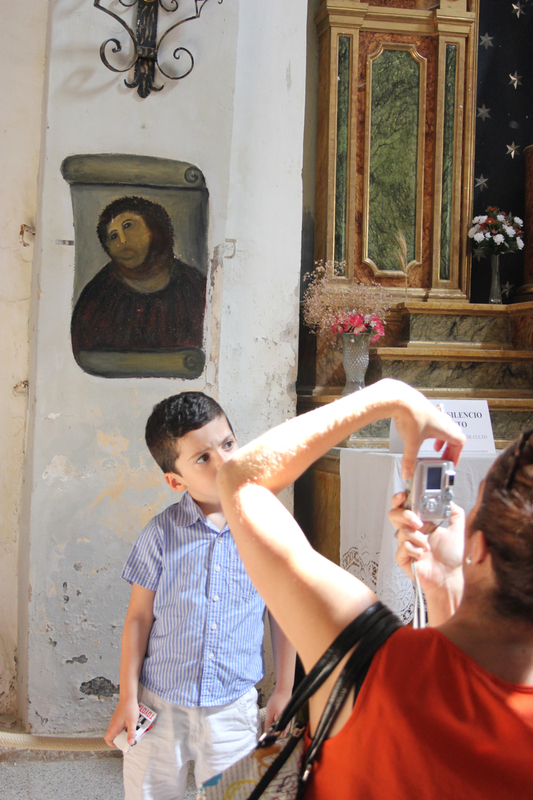 I wonder if Cecilia’s magic will remain, or if the fresco will be returned to its original state. I’m not sure that it matters in the long run. Indeed, the experience of driving up the windy roads of Saragossa, flanked by olive trees and fields of grape heavy vines hardly needs a cherry on top.